When I started this block, I didn’t imagine that it would take up so much time. 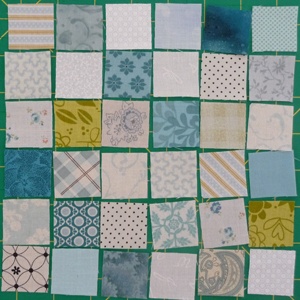 I thought: ‘What an easy block, just squares!’ Then I started cutting. And cutting, and cutting, and cutting. 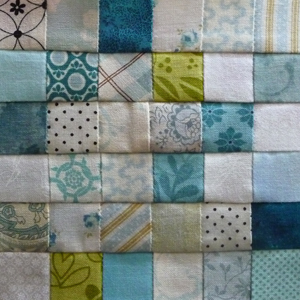 36 tiny squares out of 29 different fabrics, a few of them fussy cut. I guess cutting took me longer than actually sewing! Then I arranged the squares. I wanted a casual look. Not looking too arranged, if you know what I mean. I remember the tiler who did our kitchen walls saying, that if you wanted the embellished tiles to look as if they were scattered there by chance, you had to arrange them in some order—that would look casual. So he cemented four of the embellished tiles in a perfect square directly above the cooker, and it works! It looks as if the square pattern was there by chance. I would never have believed him, but he was right in the end. I was too lazy to do this block in paper piecing. And now look at the result. Not too satisfactory. But I decided to keep the block nevertheless because it works anyway. You just have to step back a little and watch from a distance. Normally, I would not hide behind what sounds like an excuse for inaccurate work, but I really think it is true for this block. Posted in Uncategorized and tagged farmer's wife, farmer’s wife quilt, postage stamp, postage stamp block, quilt, quilt block. Bookmark the permalink.